Win a Panasonic SC-BT200 Blu-ray system! | What Hi-Fi? Win a Panasonic SC-BT200 Blu-ray system! 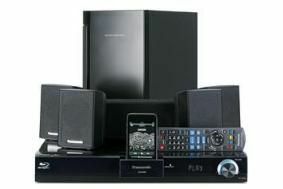 Panasonic's SC-BT200 Blu-ray home cinema system was a sure-fire winner in our August 2009 Group Test. We love the sheer all-round ability of this system, which offers high-definition Blu-ray playback and HD surround sound from a single, slimline unit with built-in amplification. It's well kitted out, too, with a slide-out iPod dock, USB and SD card inputs, an HDMI output and twin optical inputs for hooking up other kit. You also get access to Panasonic's VieraCast web portal via the Ethernet socket. The player is no slouch, delivering remarkably clear and noise-free pictures, while sound quality is taut and precise. We've got two of these beauties to give away, so to be in with a chance of winning one, enter here.